In the 40th issue of the Bed and Breakfast Traveller, we take you to Haliburton Highlands, Ontario, where an exciting fall B&B tour is planned for the end of November. Haliburton Highlands Bed and Breakfasts want to invite you to join us on our 4th year of our annual fall bed and breakfast tour, where we open our homes to visitors.In order to raise money for a local charity, selected Bed and Breakfasts from the county have opened their homes to invite you in to take a tour. Come see the different homes and meet the hosts and hostesses. Have a hot drink, hear music, see how beautifully the homes are decorated. This year we are having a heritage tour and including local heritage sites on our tour map. We have homes that range in style from Heritage Homes -in Minden, at the Minden House- to the newest Bed and Breakfasts to join the Haliburton Association: Chalet by the Lake and Whispering Pine BB Retreat. 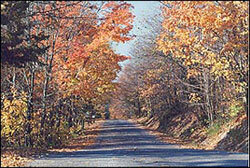 See others such as Meadow Woods, which is beautifully nestled near the Haliburton Forest. Check out Kinmount House near the old Kinmount Train Museum. In Haliburton we have Country Charm, Highland Stone Cottage, Head of the Lakes and let's not forget Sunny Rock near the Scott's Dam Road. Each Bed and Breakfast will be decorating their home and telling their story, either of the home or the modern homesteaders who have traveled from other areas to make Haliburton their residence. Visit with local artisans and craftspeople who will be demonstrating their craft and selling some of their wares. A great day outing to not only see what the Bed and Breakfasts offer to the county in housing guests, but to see the sites of the area. Check out Agnes Jameson Gallery, Minden House Museum, Pritchard House and many others. Make it an adventure for you and your family. November 29-30 between 10am and 4pm. You must purchase a passbook for $10.00: ALL of the money goes to our charity of choice, Home Support, which provides essential services to the community in Haliburton Highlands. In this book, you will find a list and description of the 9 bed and breakfasts participating, with a map of locations. Follow the signs and away you go. We hope you join us and make it a fun day. Books will be for sale at the Cranberry Cottage, The Chamber of Commerce, and local bed and breakfasts.